If you like what you see head over to my blog for plenty more tips on bargain hunting and styling your finds. I wanted to do a take on Double Denim for you with this outfit - but thought I'd add a twist. Of course the (almost) matchy double denim look works really well, but I tend to take things a bit more laterally than that. This outfit mixes prints and colours to give a pop to what is becoming a bit of a 'model off duty' staple - who wants to be another clone anyway!? This shirt was from the local hospice shop where I volunteer and is a solid size XL (my wardrobe ranges from size 0-24 and I honestly believe size is irrelevant when thrifting - it's all about imagination). I tucked it in to give it a bit more shape, and rolled up the sleeves. 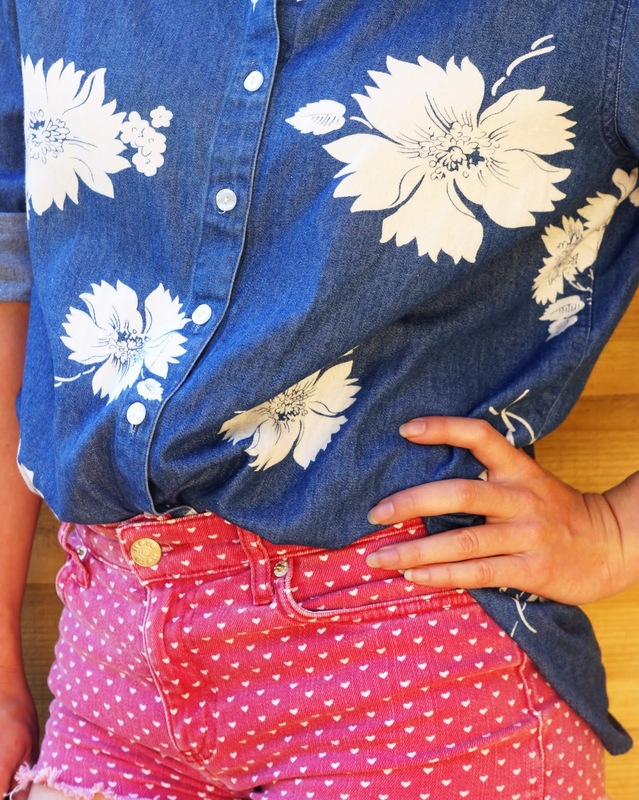 This also works great tied at the waist but I didn't want to go toooo country-girl with the shorts too. I fell in love with the oversized print as soon as I saw it, and am really into fully buttoned up collars right now so think it'll be really versatile. By contrast, the shorts are a teeeeny bit small so end up being pretty cosy compared to the shirt (#understatement)! I think the heart print is super cute and they're going to be a great staple for summer paired with pretty much everything. Finally, my shoes aren't technically from a charity shop but they are second hand - I got them on one of the Facebook 'For Sale' groups in my area. The lady lived really close and they were only £5 which is incredible! They're my go-to when I want stylish trainers instead of actual running ones. Hope you like the outfit and are inspired to go out and do some charity shopping now! Head over to my blog Pauper to Princess for lots of tips on how to bag the best stuff!